As Christmas approaches and you’re working your way through the checklist, don’t forget how many bodies you’ve got to provide a bed for! Quite often as the extra guest arrives, they get pointed to one of the residents’ bedrooms and told to make themselves at home. But what of the incumbent? – Child One is most likely relegated to a decades-old Z-Bed in the corner of their sibling’s room, or a communal space that they can only retire to once everyone else has gone to bed. However, there is an alternative – the sofa bed. Since you were small enough to be shoved onto the pull-out bed, with the mattress where you could count the springs in your sleep – things have moved on. There are now a huge range of ‘designer’ sofa beds – utility beds as we like to refer to them; beds which ultimately have a much wider range of uses, whether that is to convert into a sofa, a desk, or hideaway behind a bookcase. Returning to Copse favourites, Dwell, you have the strikingly contemporary Pisa sofa bed, available in over 7 different colours and with more than a little nod owed to Mies van der Rohe’s Barcelona Day Bed, the Pisa sofa bed has a simple butterfly-fold design with the back of the sofa folding down and levelling out with the seat to form the sofa bed. 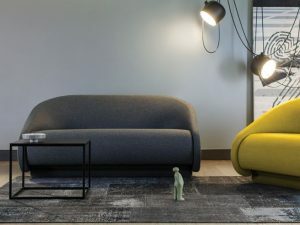 The cutaway back of the sofa adds a visually striking impact to your living room, but it’s worth trying the sofa out first to ensure that the designer feature doesn’t also provide lower back pain, free of charge. See more Dwell sofa beds. Another take on the Barcelona Day Bed is the Yoko Sofa Bed from Made.com, an apparent favourite with our fellow home and decorating magazines, Good Homes, and Elle Decoration, the Made.com Yoko Sofa Bed is available in grey, orange, and brown and still offers that impact from a beautifully designed piece of furniture, but with a more simple design, may also provide better support during its day-job. The Yoko sofa bed is available for £199. See Made.com sofa beds. Puzzle wood sofa bed and Unfurl models, both combine simple block like seat/back components with stunning mid-century wooden legs. 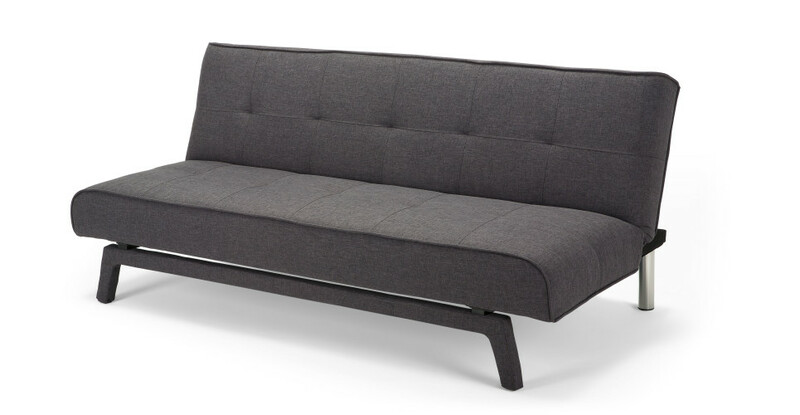 The Rollo Day Bed, owes some heritage to Charlotte Perriand’s bench but is a master class in understated simplicity in design – and goes to remind us that as long as you like your mattress firm, then you don’t need a complicated mechanical sofa bed transformer, when you could just roll out the single duvet and pillow. Another furniture design company that caught our eye is Prostoria from Croatia – with furniture handcrafted in their Zagreb workshop, the quality and detail of their designs offer something of a new approach in the sofa bed market, and one we’re grateful to see, sit and sleep on. The Pil-low sofa bed offers comfort with a built-in back support for sofa-sitting, and a clever puzzle-like structure for laying out flat when it’s time for bed. The Prostoria Up-Lift sofa bed takes a new approach to the unfolding chair and offers an almost cocoon-like chair for daytime use, that then folds over itself, lifting the base of the chair up to form a flatbed. It’s also worth checking out Prostoria’s Revolve sofa bed, which takes a similar approach to simple fold-out, but without the angled base. Habitat doesn’t really seem to have pushed themselves too hard in the design-stakes, but a favourite of ours at the lower-cost end is the Kota sofa bed a twist on the straightforward butterfly-fold, the Kota sofa bed has the wooden legs we favour, with pagoda-like sculpting to both the back and the base. See more Habitat sofa beds. Whichever option you choose, just please, throw that Z-Bed out.